The stock market has turned volatile, and the income stock sectors feel downright unwelcoming. Since I have contact with thousands of investors I learn there are a thousand different situations in the market. The investor who bought at a higher price doesn’t like to see the share price drops in his portfolio. Another is expecting a cash infusion next week and hopes prices will stay down until she gets the money and can load up on shares at the current low prices. 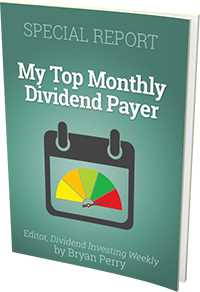 I regularly tell my subscribers that you can’t earn dividends unless you own shares of dividend paying stocks. Trying to time the market can easily leave an investor without any shares that are paying dividends. It takes a different mindset to get away from worrying about share prices and to focus on building an income stream. The good part is that when the stock market corrects, or gets scarily volatile, the income investor will continue to rake in dividends. In a choppy market I like to add to those stocks that hit my “sweet spot” combination of current yield and dividend growth. In a flat or volatile market, cash dividends are real returns, so a higher yield can be viewed as a cushion against share price movement. Dividend growth is a factor that can make a stock more attractive even if the market is not in a share price appreciation mode. One strategy is to find dividend stocks with low yields, such as 3% or less and double digit annual dividend growth. At the other end of the spectrum are the 10% yield stocks, but with little potential for dividend growth. If stock market returns go flat, I recommend going for the middle ground. Find stocks with attractive yields. In the current market the range would be 5% to 7%. These stocks should to have recent history and prospects of mid to high single digit dividend growth. The dividend payments give you solid cash returns, and the dividend growth prospects can support share prices in a volatile market. In the long run, this combination should produce total annual returns in the low double digits.